Mira® MX x64™ is a native 64-bit Windows image processing application which leverages the memory and speed advantages of the 64-bit Windows operating system for processing very large images. It provides exceptional tools for quantitative image calibration and processing, visualization, analysis, and measurement with a powerful programming extension language for scripting, algorithm development, simulation, and other computational needs. Application areas: Product engineering, testing, and quality assurance, microscopy, biomedical research, computational biology, radiography, image & data exploitation, physics, materials science, nanotechnology, reconnaissance, and other critical applications. 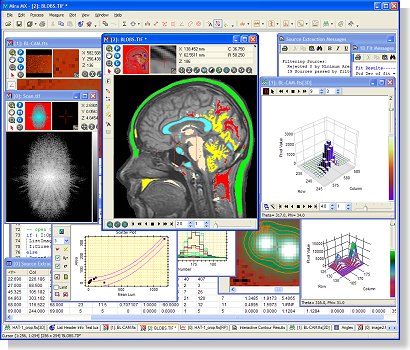 Mira MX showing 1, 2, and 3-D visualization, analysis, scripting, and measurements. Mira MX x64 defines the state of the art in image processing software, with the ability to display, analyze, plot, process, and measure images and image sets having integer, real, or integer and real format color. Mira MX x64 significantly raises the standard for scientific image and data analysis software. The Mira GUI provides an unmatched number of powerful tools at your fingertips while being designed to be intuitive. To this, we added our Scripting module to provide a tremendously rich, yet intuitive environment for scripted and specialized tasks that are simple, complex, or anything between, from low level functions to our powerful high level processing tools, and with or without the integrated GUI. The speed, power, and easy-to-master elegance of the Lua language combined with more than 600 class methods and functions provide unparalleled performance. It's both fast to learn and fast to execute. Mira MX x64 includes the MX Script language, a versatile 1-d Data Fitting package, an extensive collection of image calibration, filtering, and processing tools, precision image registration, automated processing of image stacks, unparalleled animation and comparison of images and plot data, plus a rich suite of image quantification tools. Feature-rich, fast, and easy to use scripting language, including our powerful File Event Scripting capability. Superior visualization and analysis tools. Realize complex data analysis strategies using intuitive procedures. Measure exact coordinates, distance, angles, FWHM, area, statistics, polygon properties, etc. in image units and physical (world) coordinates. Work with TIFF, FITS, BMP, JPG, and other image formats using binary data, numeric data of 8 to 64 bits, and RGB data of 24 to 48 bits. Developed with scientists & engineers in the field to work the way you think about processes and procedures. Optimized graphics and fast numeric processing help boost productivity. Mira MX does not use a dongle or a network-locked license that can limit your productivity. "...[Mira] is the most intuitive piece of software I've ever used. Excellent interface all around. I can tell you put some thought into the functionality & navigation of the package." Mira Pro x64 (for astronomy & space sciences). 64-bit Windows x64 Operating System in version 7, 8, or 10, or a 100% compatible Windows environment on Linux or Mac. Minimum Platform: Windows® 7x64, 16 GB RAM.